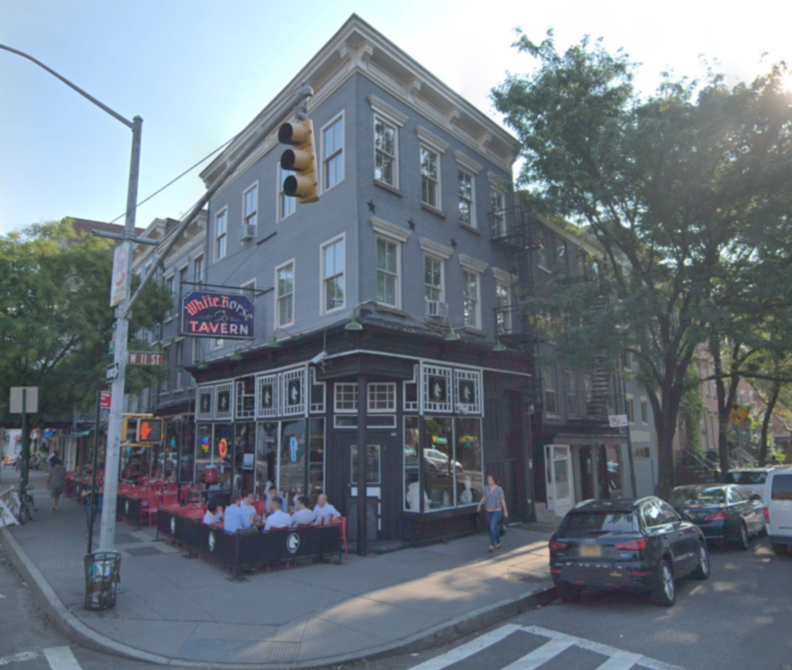 A coalition of tenants living in residential buildings owned and operated by notorious landlord Steven Croman held a rally and wake for the White Horse Tavern Thursday urging the city to landmark the interior of the historic tavern. About 30 people attended the rally held outside the tavern, located at 567 Hudson Street in Manhattan, according to Cynthia Chafee, co-founder of the Stop Croman Coalition. Five public officials, including City Council Speaker Corey Johnson, Rep. Jerrold Nadler, Manhattan Borough President Gale Brewer, submitted a letter to the Landmarks Preservation Committee stressing their concern for the preservation of the interior of the building. "Although the new owner has pledged to maintain its history and preserve the legacy, we believe the interior will now be open to destruction and that a landmark designation of the inside of this cultural and literary treasure is necessary to ensure its protection," officials wrote in the letter, according to Curbed NY. Croman is part of a group of investors in contract to buy the building for $14 million. Eytan Sugarman of Hunt and Fish Club NYC, who signed a 15-year lease on the building, is said to have done so under the condition that the bar be maintained as is, according to the Commercial Observer. But many people are not convinced Sugarman will hold up his end of the bargain because Croman is involved. Croman was confirmed as one of the building's landlords by a representative to Sugarman, according to Curbed NY. "They say the owner who leased the restaurant for 15 years is going to keep it exactly the same, but every time Croman has a commercial business in a building, once the lease is up, these people are gone," said Chaffee. The Greenwich Village Society for Historic Preservation has also shown its support in preserving the interior of the building. The Preservation Society submitted a request to landmark the tavern earlier this month. The exterior of the building itself is landmarked as part of the Greenwich Village Historic District but landmarking the interior, a rare move in the city, would protect fixtures and woodwork that date back generations to when the tavern was a hangout spot for James Baldwin, Allen Ginsberg and Dylan Thomas. Croman's long history of tenants' rights violations and harassment is widely known around the city.